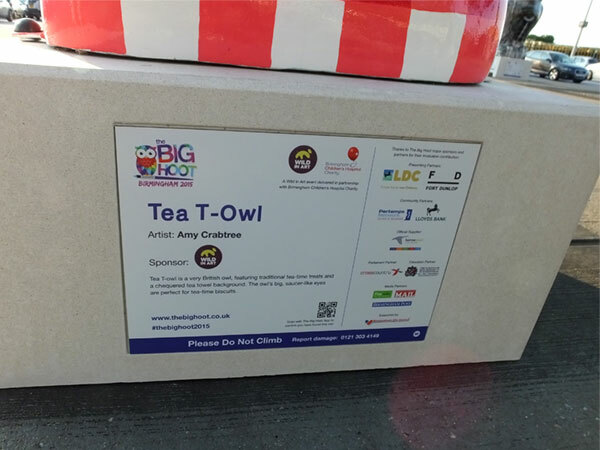 Watch me paint Tea T-Owl, my owl for The Big Hoot 2015 in Birmingham, in less than 4 minutes! The Big Hoot is a public art project organised by Wild in Art, in which 89 giant owl sculptures painted by artists are displayed around Birmingham for 10 weeks over the summer. There are also over 100 owlets painted by schools and community groups. 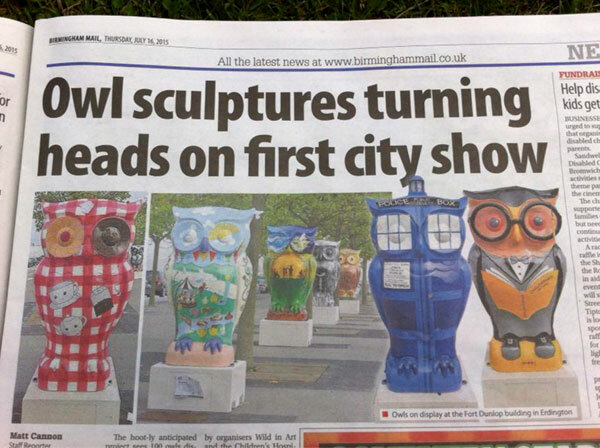 At the end of the project, the owls will be auctioned to raise money for Birmingham Childrens Hospital. Tea T-Owl is the largest painting I’ve done so far – it took over 70 hours to paint, over the course of a week! The owls are huge – 1.6m tall and about a metre wide. And each of the checks you see in the video above took 3 coats of paint, so it was a huge project! 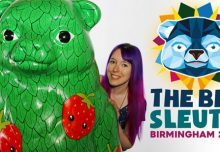 Visit Tea T-Owl in Birmingham! 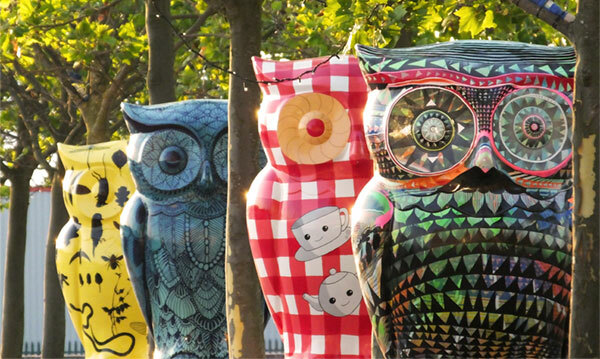 You can find Tea T-Owl in Birmingham city centre from 20th July – 27th September 2015. He’s at the junction of Corporation Street and James Watt Queensway – number 60 on the The Big Hoot Trail Map. If you find him I’d love to see a pic – send me your photos on Twitter or Facebook, or tag me on Instagram! I saw the other owls at The Big Hoot preview party, and they really do look stunning! 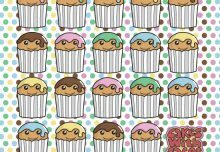 There are some really fun and colourful designs, and exceptionally talented artists. It was fantastic to see owls I recognise from the painting studio, that I’ve seen in progress, now finished and complete, and it’s been fun to spot pictures of owls I recognise in the news and on Instagram! Why not spend a day owl-hunting in Birmingham this summer? 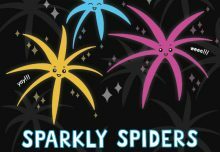 Most of the owls are in the city centre and easily walkable from the stations, and there are also some around the districts for the more determined owl-hunter! 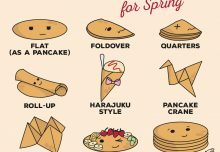 All the details are on The Big Hoot website, and there’s also an app for iPhone and Android. Thank you to Milan Topalović for the photo – check out his owls (one is second from left), they’re fantastic!